Please click on the links below to read and/or print the latest edition of "The Louisiana Journal". "The Louisiana Journal" is a newsletter publication of the Disabled American Veterans, Department of Louisiana, published 3 times a year. The newsletter was created as legal size paper (8 l/2 x 14) with page border and is best printed in this format if possible. You will need legal size paper for printing and must adjust your copier accordingly to print the document as created in legal size format. You may also have to do additional adjustments and experiment with different settings to print it as shown and with page borders on all sides and bottom. 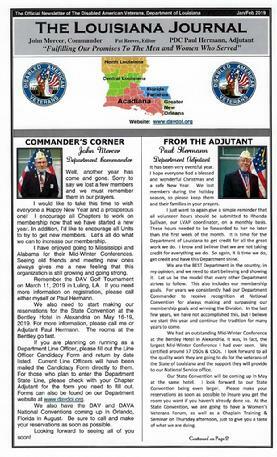 Because of the size of the file, the newsletter has been broken up into separate pdfs each containing two pages of the "Louisiana Journal" for easier downloading.